Telescopic forklifts — or Telehandlers for short — are extremely versatile crane-like pieces of equipment that can perform a variety of essential lifting functions. With more than 35 years of industry experience, Chicago Industrial Equipment is your trusted telehander source in Chicago and beyond. You can always count on us to offer a wide selection of new and used SkyTrak telehandlers in IL that will help you get more work done in less time! The SkyTrak brand is part of the JLG family of lift equipment known throughout the industry for their unbeatable combination of power, reach and versatility. The SkyTrak telehandler line consists of all-wheel steer equipment with a reach of up to 54’ in height and an impressive 10,000 lb. lift capacity. No matter what type of work challenge you face, you’ll find a SkyTrak telehandler for sale at Chicago Industrial Equipment that can rise to the occasion! Are you looking for ways to keep equipment costs low? Chicago Industrial can help you reach your profitability goals with our wide selection of used SkyTrak lifts. Minimize expenses without sacrificing quality or productivity. At our own on-site reconditioning shop, we restore used SkyTrak telehandlers to like-new condition. We also sell “as is” telehandlers that were recently used. With at least 50 lift trucks always in stock and ready to roll, we have you covered! Need to Finance Your SkyTrak Telehandler Purchase? We Can Help! Take advantage of our wide range of flexible financing options that can make acquiring a new or used SkyTrak telehandler affordable for even the tightest heavy equipment budgets. We work closely with Direct Capital, a leading national lender that is dedicated to helping companies like yours achieve success. You can apply online, and it only takes a few minutes. 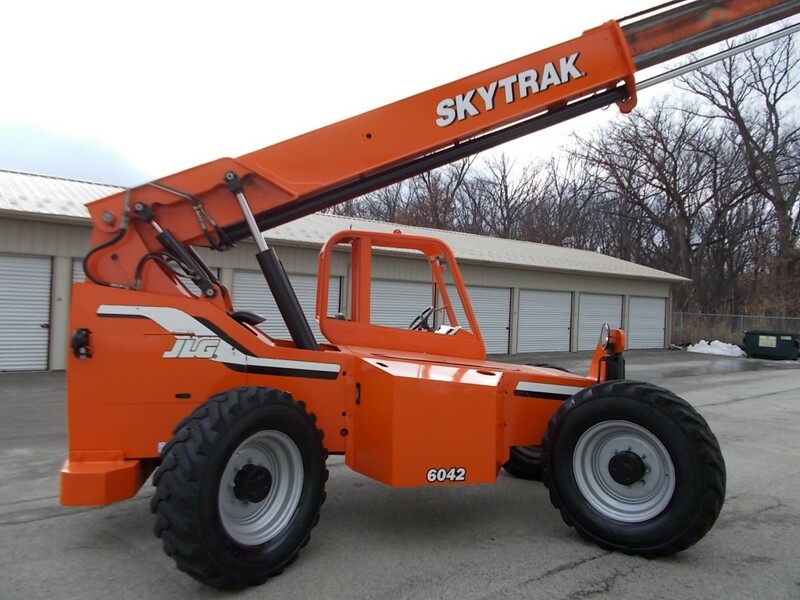 Whether you need a SkyTrak telehandler in IL or elsewhere, Chicago Industrial Equipment can accommodate you. We can ship your machine to anywhere in the USA, Canada, Mexico or other parts of the world. Contact us for a free shipping quote! Check out our online inventory for our current selection of SkyTrak telehandlers. Be sure to check back often as we’re always updating our heavy equipment fleet to better serve you. If you don’t see the specific machine you’re looking for, just let us know, and we’ll be happy to locate it for you. Make Chicago Industrial Equipment your one-stop source for all of your lift equipment needs!